Located on Québec Head, the northeastern point of Wolfe Island, largest of the Thousand Islands. The Point has many names including: Quebec Point, Quebec Head, Hemlock Point, and East Point. This is a beautiful spot to visit and explore on Wolfe Island, just be cautious that this Lighthouse is now on private property. In the summer you can see the beautiful sailing ships and gorgeous waterway leading to near Clayton New York. The General Report of the Commissioners of Public Works for 1852-1853 noted that lights had recently been established at Grenadier Island, Fiddler’s Elbow, Lindoe Island, Gananoque Narrows, Jack Straw Shoal, Spectacle Shoal, Red Horse Rock, and Burnt Island, permitting the mail boats to operate at night between Brockville and Kingston. Keepers were listed for Fiddler’s Elbow Lighthouse through 1857, so the light was likely deactivated that season, but as the lighthouse on the eastern tip of Wolfe Island was not established until October 25, 1861, it is not clear whether the tower from Fiddler’s Elbow was moved to Wolfe Island or not. Thomas Kilty and Robert Gillespie were both listed as keepers of Wolfe Island Lighthouse in 1862 and 1863, but after this time, which coincides with the construction of a keeper’s dwelling on the point, Robert Gillespie was listed as the sole keeper up until he was superannuated in 1885 and replaced by his son William. 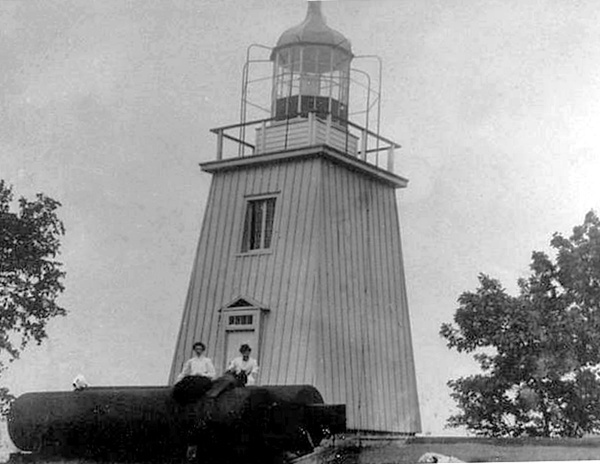 The lighthouse is placed on Quebec Point, and is a square white buiIding, containing a fixed catoptric light, 36 feet high. The light consists of three No. 1 flat wick lamps, with three 15-inch reflectors. The lantern is of iron, six feet in diameter; size of glass, 15 x 12 inches. Mr. Robert Gillespie, the Keeper, has four children, and he keeps his light in good order. The lighthouse requires painting. Eight new window sashes are required for the dwelling, of 20 lights each; size of glass, 7×9 inches. The Keeper was ordered to procure the same. Robert Gillespie, who, for a quarter of a century, had been in charge of the lighthouse at Port Metcalfe, foot of Wolfe Island, died on Thursday, aged 83 years. He was a brother of John Gillespie, Pittsburg, and leaves a widow and seven children. He emigrated to Canada in 1840, and previous to his appointment as lighthouse keeper was a farmer. For some time he suffered from rheumatism, and so severely that he could not walk. He was highly respected by all who knew him. During William Gillespie’s tenure as keeper, which spanned over fifty years, a thirty-three-foot standard wooden tower was erected on the point in 1911, replacing its worn-out predecessor. Lightkeeping was likely considered as a secondary source of income for William Gillespie as in various census records his occupation is listed as farmer. Prior to succeeding his father as keeper, William served as the custom house officer for Port Metcalfe. 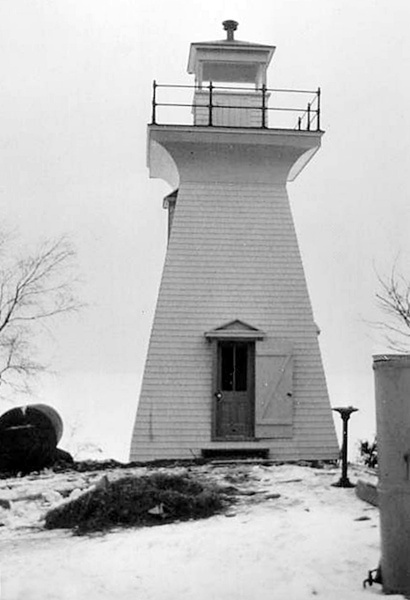 Wolfe Island Lighthouse remains active today, though its lantern room has been removed. A replica of Thomas Point Shoal Lighthouse was built near the decapitated tower as a private residence, while the original keeper’s dwelling reportedly remains standing farther away. Keepers: Thomas Kilty (1862 – 1863), Robert Gillespie (1862 – 1885), William Gillespie (1885 – 1939), Everett Woodman (1940s – 1954). General Report of the Commissioners of Public Works, various years. Annual Report of the Department of Marine, various years.